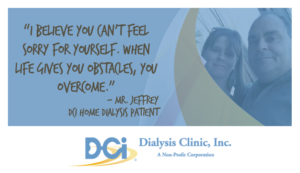 Mr. Jeffrey had been an in-center hemodialysis patient since April 2009, and he was tired. Not only was tired of his commute to the dialysis center, but he was also tired of missing time with his family. Mr. Jeffrey decided it was finally time to try something new. After meeting with the home hemodialysis training coordinator in his clinic, Anne Purcell, RN, DCI Castleton in Staten Island, they agreed he would be a great candidate to trial home hemodialysis. The flexibility of dialyzing at home would allow him to spend more time with his family, and also would be easier on his body since he would be dialyzing more frequently. Now Mr. Jeffrey could start his dialysis around his son’s wrestling and baseball events, without having to coordinate an in-center dialysis schedule. “After a while, in-center dialysis can take a toll on you, it can be violent on the body. With home hemo, it is easier on my body. I don’t feel beat up by dialysis,” he said. Last September, Mr. Jeffrey agreed to explore the idea of home hemodialysis. After five months of training, Mr. Jeffrey made the switch. On February 6, he dialyzed for the first time in the comfort of his home. Mr. Jeffrey is Anne’s third patient to transfer from in-center to home dialysis. Her fourth patient will be moving home in March, and her fifth patient will begin home hemodialysis without ever having dialyzed in-center. With in-center dialysis, some patients take a day or so to recover to full health. Anne, however, believes her patients spring back quicker when they dialyze at home. Mr. Jeffrey certainly agrees.